Featuring 58 cards. Click here for a detailed visual guide. Featuring 10 cards. Click here for a detailed look at the entire set. Inserted 1:1,717 packs. Featuring 5 cards. Click here for a detailed guide. 20 cards. Inserted 1:136 retail packs. Click here for a detailed look at the set. Topps is no stranger to looking to the past to make something new. 2013 Topps Archives Baseball combines designs from several sets from the past to create an eclectic release heavily rooted in nostalgia and the fun that comes with it. Hobby boxes have a pair of on-card Fan Favorites autographs. 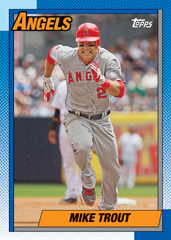 The 2013 Topps Archives set has 250 cards, including 50 short prints. The first 200 cards are divided into four sections, each using a different Topps Baseball design from the vault. 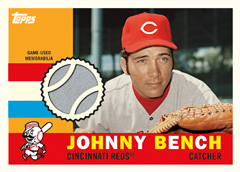 The first 50 cards take collectors back to 1972. Cards 51-100 jump ahead to 1982. Numbers 101-150 harken to the first time Transformers were kings of the toy aisle, 1985. The final 50 cards of the base set take on the 1990 Topps Baseball design. Fifty short prints (1:4 packs) feature retired stars who are part of the Fan Favorites Autographs and use a mix of designs. Archives Gold parallels are numbered to 199. Hobby-exclusive Printing Plates are the only other base set parallel. 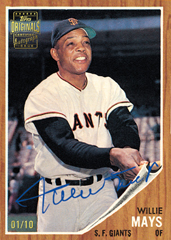 One of the biggest draws in 2013 Topps Archives Baseball are the Fan Favorites Autographs. Falling two per hobby box, the set focuses on retired players who were popular with fans, no matter their on-field accomplishments. While there are superstars, collectors can expect more signers like Otis Nixon, Howard Johnson, Darren Daulton, Hubie Brooks and Ellis Burks. The cards use classic designs but use different photos. Framed Autographed 1973 Topps Minis are numbered to 25. Players include such past greats as Mike Schmidt and Bob Gibson paired alongside current stars like 2012 National League Cy Young winner, R.A. Dickey, and David Wright. Framed Mini Autographs are only in hobby packs. Signed buybacks are the order for Topps Originals. Numbered to 10, each is signed on a vintage Topps card. A stamp has also been added. Triple Autographs are just that, combining three signatures of players from the 1970s, 80s or 90s. Collectors can also look for dual autographs. Finally, some of music's biggest stars from the 1980s (not to mention some pretty big hair) shine in Heavy Metal Autographs. Tommy Lee, Dee Snider, Lita Ford and Bobby Brown are among those in the set. There is also a Real Metal parallel numbered to 25. 2013 Topps Archives Baseball doesn't have much in the way of memorabilia cards, but there are some. 1960 Topps Relic Cards use the horizontal design to display a game-used swatch. Subjects include Bryce Harper, Justin Verlander, Prince Fielder and Johnny Bench. 1969 4-in-1 Stickers have a quartet of players on a single insert. The checklist mixes players from the past and the present. 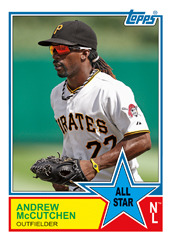 Current superstars are showcased in 1983 Topps All-Stars, which are based on the All-Star subset used 20 years earlier. Autographed versions are numbered to 25. Other basic inserts include Gallery of Heroes and 1973-74 Topps Action Emblems. The Stadium Club brand makes a bit of a comeback with the hobby-exclusive Triumvirate Illuminator inserts. Those who collect three cards from the same team can fit them together into a panel. 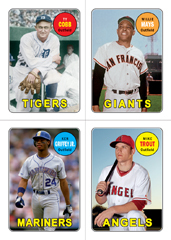 Classic baseball designs aren't the only inspiration for 2013 Topps Archives Baseball. A pair of insert sets draw from the gridiron and the hardcourt. Mini Tall Boys borrow from the iconic 1965 Topps Football design. Mini Tall Boys Autographs are numbered to 25. Similar are 1972 Topps Basketball inserts, which bring a towering look to baseball for the first time. Mixing active and retired players, there is also an autographed version numbered to 25. 2013 Topps Archives Baseball also has a few bonus box toppers inserted randomly. 1971 Topps Greatest Moments Autographs take from one of the most valuable oddball sets ever made. The over-sized cards are numbered to 99 and use a sticker autograph. Returning as random case loaders are original Topps player contracts, which also come with an autograph from the player, and Touched by Greatness autographed handprint cards. The Topps vault has been raided for prize redemptions, including original sets, packs and singles, and other unique items. 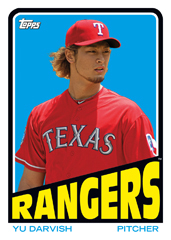 Topps is also holding a two-week hobby shop promotion in conjunction with the set's launch. Good: Base cards and autographs on past card designs. Heavy Metal Autographs. Cut Signatures are a rare bonus. Bad: Short prints are hard to find. Relics look bland and boring. Tall Boy cards not ideal for some collectors. 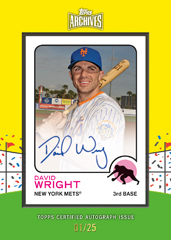 The Bottom Line: Topps once again delivers to the hobby a fun and eclectic mix of retired and current MLB stars use past released Topps baseball card designs. 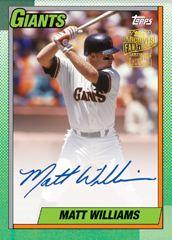 For newer collectors, 2013 Topps Archives presents a hobby history lesson of years past. The photography is strong, which is common in a lot of Topps sets. The variety of inserts, short prints, game-used, and autographs give collectors plenty of opportunity to chase key additions for their collections. The card design is both exciting and nostalgic. Using old card design will be hit or miss for collectors who don't like the nostalgic designs. The inserts provide a sense of "What if? ", with the utilization of 1965 Mini Football Tall Boys, 1972 Basketball, 1969 4-in-1 Stickers, and 1983 Topps All-Stars. The best looking inserts, hands down, are the Triumvirate Illuminators. Relics come from the 1960 Topps design. They are kind of a let down compared to how nice the autographs look. Autographs are plentiful in this product and come in many different formats. The Triple Autographs offer fans a chance to collect players from the 70s, 80s, and 90s on one card. Cut Signatures offer collectors a chance to pull autographs of many famous actors and actresses. The chance of possibly a Tommy Lee or Axl Rose autograph from a baseball product is pretty cool. The 200-card set features card designs from 1972, 1982, 1985 and, my personal favorite, 1990 Topps. There are also 50 short-printed cards. While not necessarily all variations, there are also a handful of rare "error" cards. 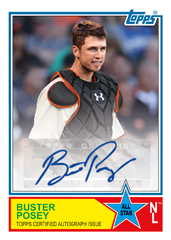 Topps has brought back the gold variants started with last year’s release. Non-baseball autographs that can be pulled in this product are Carrie Fisher, George Clooney, Jay Leno, Warren Beatty, Tommy Lee, Axl Rose, and more. 2013 Topps Archives is packed variety to the point where there should be something that appeals to almost every type of collector. 2013 Topps Archives Baseball guarantees two autographs per box. Set collectors will need to spend some money and patience to complete the set including all the short print cards. The inclusion of the entertainment autographs will help attract other collectors to this product, but may turn off some traditional baseball collectors. 2013 Topps Archives Baseball has so much to offer, especially given the price point. Collectors will likely enjoy the nostalgic design,s in addition to the excitement pulling their favorite retro or current players. Topps Archives continues to be a brand many collectors depend on for some much-needed cardboard therapy. Taking a look at the info, I can’t wait for this release! I loved 2012 Archives; so I’ll probably pick up a box or two of this. But, did they really have to do the 1990 design? Ugh. Why? The only thing this product does is dilute the Heritage brand. Not that I collect either, keep up the shortprints Topps, I’ll spend my money elsewhere. I LOVED 2012 Archives so was very excited to hear about this one BUT, you are right, these are exceptionally ugly years for Topps baseball. I like ’72, but yikes, the others are truly bad. Where’s the 1955 look? To be fir, there really weren’t many good looks after 1981, at all. The thing that pushes this over the edge for me into the “I probably wont collect it” is the lackluster “Fan Fave Short Print” list. I think the checklist looks week in my opinion but was going to buy a couple boxes on release just for fun. I have since changed my mind. Our local retail store had there blasters out a day before release date so I got one. When opening the cards I couldnt get into them, no excitement like I usually have opening packs. Thinking I will save my $80 a box for upcoming release of Ginter. Inexpensive + Great player selection + All on-card autos = WINNER!!! I’m going to my local hobby dealer today to pick up 2 boxes. Can’t wait. I personally do not like the 1972 Basketball idea nor the 1965 Football Mini Tall Boys idea. The 1969 4-in-1 stickers are too small. I think last year’s Archives had a better pool of autographs than this year as well. I do like the Triumvirate idea to an extent but I wish they were a little more common. Gallery of Heroes are interesting, I found 3 in 5 hobby boxes, but two of them had peeling corners. The one 1960’s relic that I pulled had two beaten up corners that had to have happened at the factory because the rest of the cards in that pack were pristine. I would prefer that the Archives line didn’t branch out into so many different things; at least 3 of the different styles could have been eliminated, and anything non-baseball should have been put into Allen & Ginter, which is more of a miscellaneous set than Archives should be. Overall, I love the 1972 and 1982 Baseball design, which is the main reason why I decided to buy these. The 1985 is meh, and the 1990 is horrid. If they had done 1991 I would have loved it more. I am not the collector I was when I was a kid in the 80s. As an adult collector, I appreciate the look of these cards. The ugly plain features of the 1990 set is one of my favorite looks… But this isn’t why I am writing. On my recent outing to the land of Wal*#%$, I picked up a blaster of this set. I had previously purchased two packs (and pulled five of my team out quickly) and didn’t notice a thing as far as miscuts. The blaster was full of them. Not that this isn’t normal, but I’d have thought in the years since the 80s, machines would be aligned better. I like the old school look which brings back memories of being a kid and getting packs for 25 cents. Great review. great review .Not a big fan of this design love the autos great choice of players there. I really like the Gallery of Heroes stained glass cards. I would really like to get my hands on one of the hand-print autographs. Overall, it’s a nice design. Great looking set. Have always liked the fan favorites autographs. Great review – love the some of the autos in this this year! I like the 73 and 83 remakes. I am not a big fan of the basketball remakes of 1972 or the 1990. I wish the cost was so high, but overall I love the retro cards. Very nice review of a very nice product. This product has a very good mixture of current and past players.Also, a good variety of cards appearances. Nice Review, Like the fact it has past players in it. I like the stained glass look. This set is what Archives Football should have been! I really like the look of these cards! Good review and accurate. I actually like the different varieties an love the stained glass cards. Pretty reasonable price for a hobby box. always nice to get autos signed on the card, no tape in these. Also, I do like the inserts, makes for nice team sets with Stickers, ’72 NBA look, NFL look for Tallboy mini’s. Needs a few more superstar autos to get a 5-star rating. Great, fun entry level product with some great things sprinkled in. I pulled a Touched by Greatness auto. We’ll see who it is! Purchased a rack-pack of the 2013 today and pulled a Fan Favorite SP Vince Coleman #233 and a Lloyd Moseby #243 the trademark date at the bottom of the Moseby is 2013 just like the rest in the pack, however the date on the Coleman card is 2012. What’s going on with this? This is by far my favorite release year out of the Archives to date. The inserts really stand out to me. The Gallery of Heroes subset drew me in quick when I first discovered these Archives releases. The 2015s almost bore me and the 2014s are long gone from shelves. What is left of those are too expensive anyway. I admit a small bias to this particular due to having pulled one of, if not the, greatest card in all my collecting years – a 1983 All Star Carlton Fisk Auto #3 of 5. And that was simply out of a Wal Mart blaster box! Over this set just produces and does it for me. 2013 Topps Archives Baseball Hobby Box - Factory Sealed!